As part of Asian Heritage Month we invite you to an afternoon with a double reading from V6A: Writing in Vancouver’s Downtown Eastside (Arsenal Pulp Press: 2012) + Ricepaper Special Aboriginal and Asian Canadian Writers Issue Winter 2012. V6A is the postal code prefix for Vancouver’s Downtown Eastside, an area challenged by poverty-related issues and maligned as “the poorest postal code in Canada.” But the Downtown Eastside (DTES) is also beloved by residents for its optimism, community ties and heterogeneity. 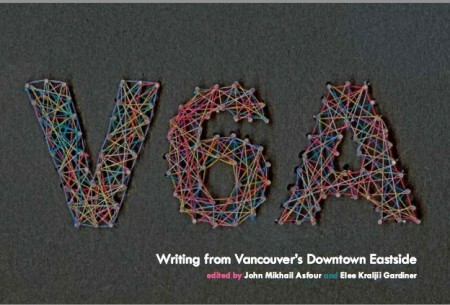 V6A: Writing from Vancouver’s Downtown Eastside is an anthology of creative writing by 32 people who have been a part of the DTES community in some way, at some point in their lives. Published by Arsenal Pulp Press, this map of a moment in the DTES’ creative life reappropriates the code and allows a community to define itself, on its own terms. Edited by Elee Kraljii Gardiner and John Asfour, shortlisted for the city of Vancouver book award. Ricepaper magazine is a Canadian magazine which has covered Asian Canadian literature, culture, and the arts since 1994. The Aboriginal and Asian Canadian issue is the first ever special double issue, with 96 pages with features, reviews, poetry, and prose from writers across Canada. Guest Editors include Joanne Arnott (Aboriginal Writers Collective West Coast), Lee Maracle, and Jim Wong-Chu. Featuring: Joanne Arnott, Jim Wong-Chu, Alan Hill, Elee Kraljii Gardiner, Jonina Kirton, Elaine Woo, Patrick Foley, Henry Doyle; other readers to be confirmed. Readers from V6A will open the event after which there will be a short break before the Ricepaper readers take the mic. Refreshments provided.